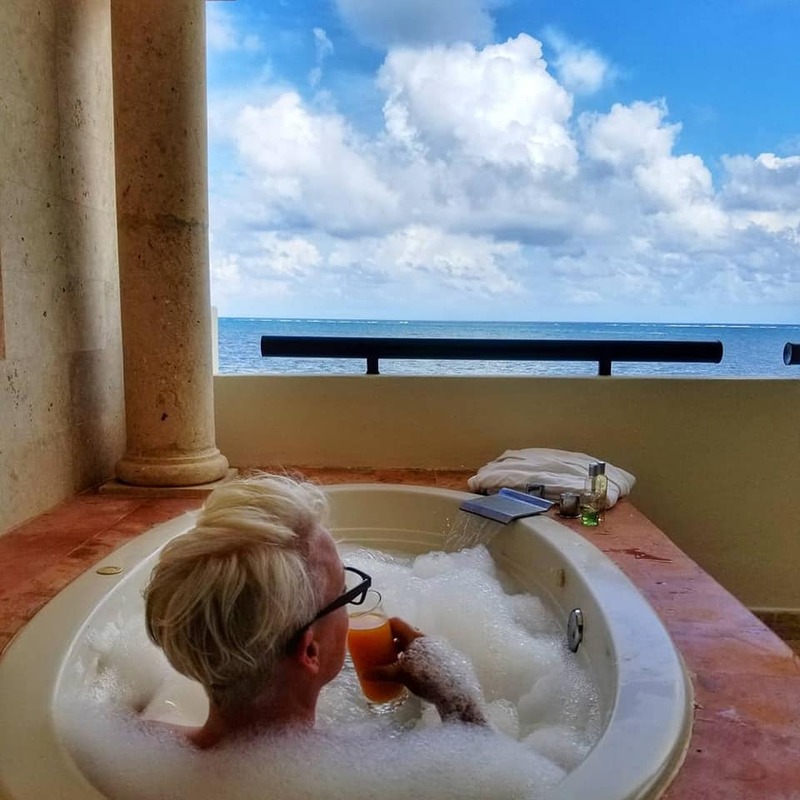 Today I’m going to tell you all about an all-inclusive resort that knocked my socks off. We are a family that travels frequently and I hate to say it but when I travel these days I don’t expect to be wowed. 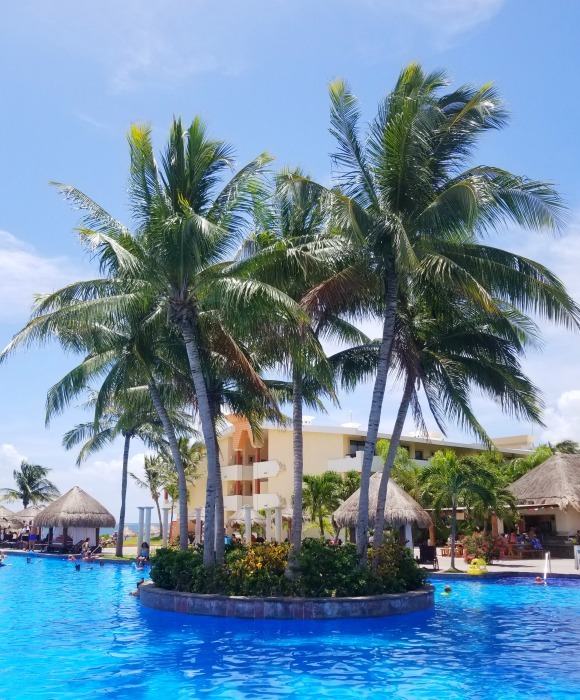 My recent trip to Now Sapphire Riviera Cancun plain old knocked my socks off in a very good way! We planned this trip in order to meet my friend Tammi from My Organized Chaos and her 3 daughters. We live in Ontario and she’s WAY over in Alberta and over the years we have made a tradition of travelling together for our getaways. With 5 children aged 10-14 plus Tammi and myself, we thought meeting all of our needs would be impossible but honestly Now Sapphire accomplished it! I have partnered with Now Resorts. In exchange for this review and sharing my honest opinions with you all, they upgraded us to the Preferred Club. The resort is only 20 minutes from the airport which makes for a short travel day. 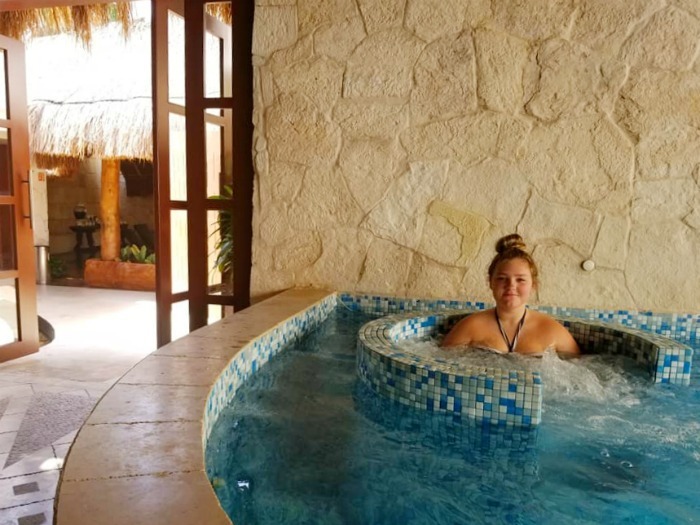 Now Sapphire offers itself as a resort where you will enjoy Unlimited-Luxury® which means that each and every guest receives the best treatment. 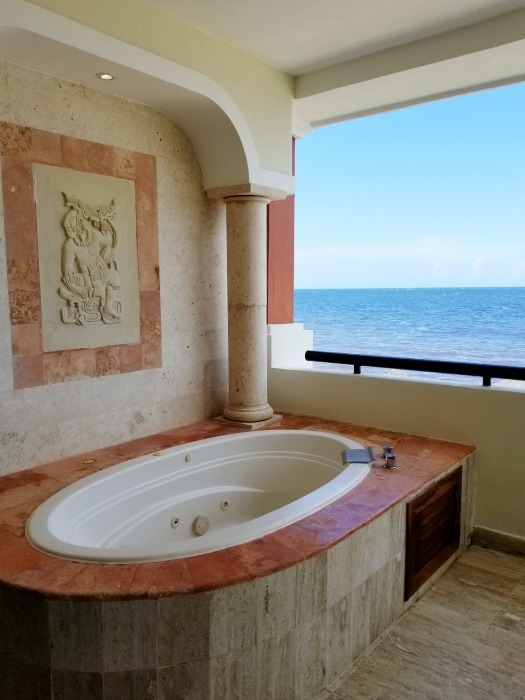 Everything is included in your price, there are no wristbands and each room has thoughtfully provided luxury amenities. We were greeted with a cool towel and a drink upon arrival. We were booked into the Preferred Club which meant that we were brought to the air-conditioned Preferred Club Lounge to check in. 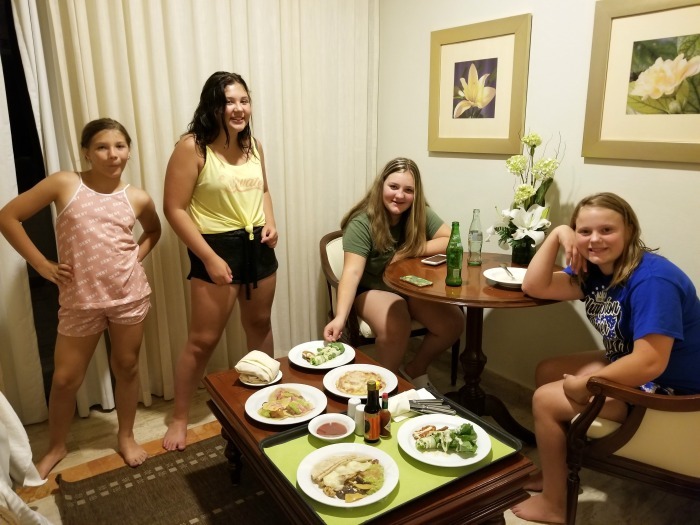 The kids LOVED this, after a day of travel they were jazzed to see a buffet of finger foods, drinks and desserts to enjoy while I filled in the necessary paperwork. Now Sapphire Riviera Cancun is a resort where one can easily walk from one end to the other. This was a refreshing change from the massive hotel resort I’ve been at in the past. 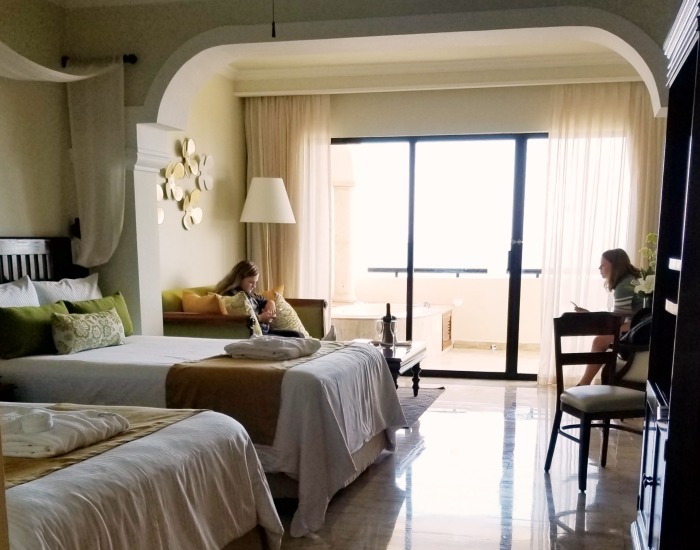 The rooms stretch length-wise along the beach, with the main hub of the restaurants and pool at one end and the beach-side swing bar, marina, spa and adult preferred club pool at the other. Our room was located directly next to the main pool and restaurant areas. 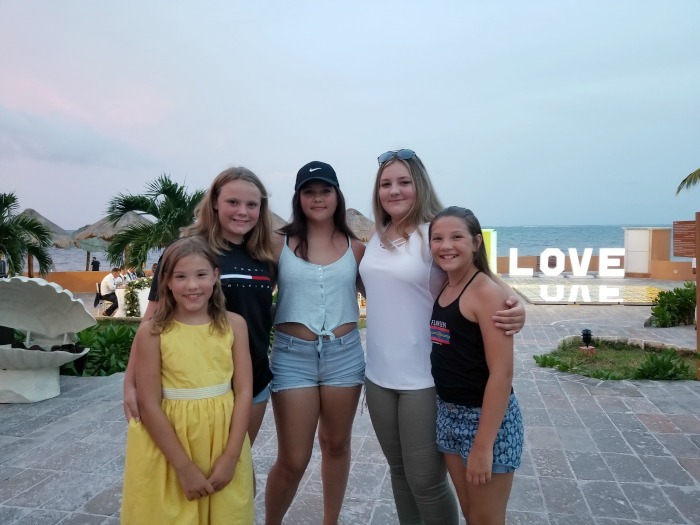 We love the location, overlooking the beach and being just steps from everything meant the teenagers had more freedom and we Moms had even more time to RELAX. 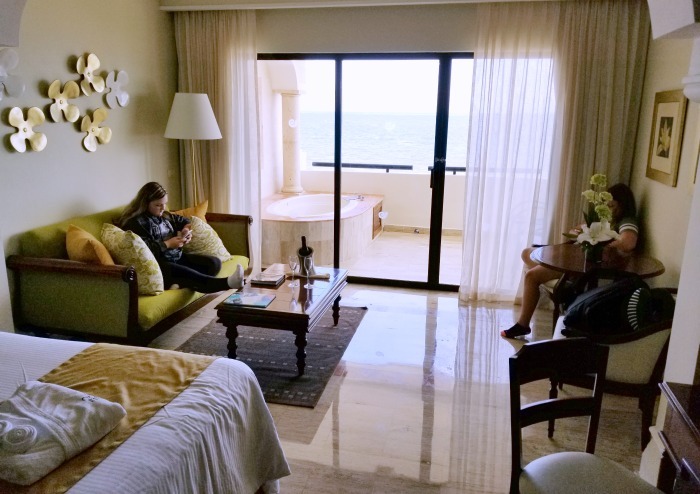 With 2 queen beds, a pull out couch and the TO DIE FOR balcony…well just look at how beautiful the Preferred Club Jr Suite Ocean Front is! 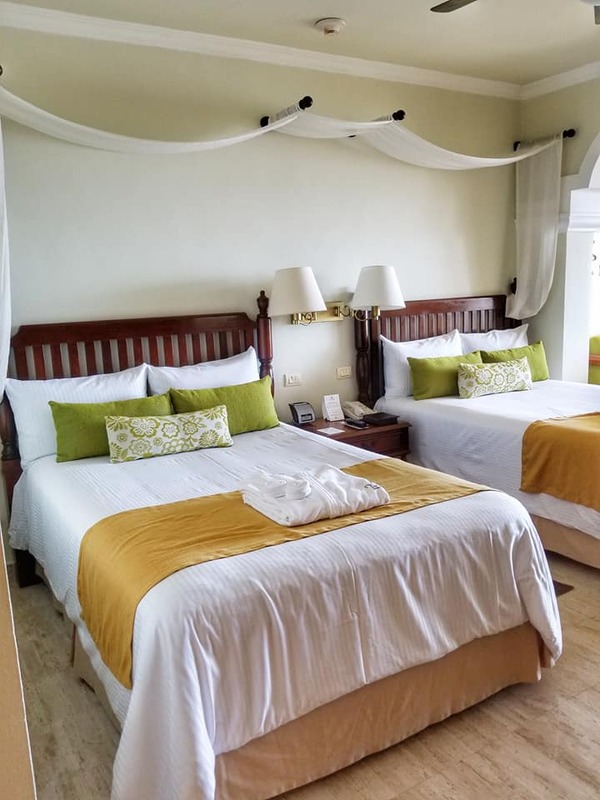 The little touches can make a stay and this room comes with plenty of bathroom products, fully stocked bar (just ask and it will be stocked with only the drinks you prefer), hairdryer, robes, free wifi and of course that jacuzzi on the balcony. If you’re a reader of my blog, you are well aware of the fact that the quality of a mattress matters to me. The mattresses here are GORGEOUS! Combine that with quality linens and the pillow menu and I can confidently say that each traveller will have a comfy sleep. Can we take a moment to appreciate the evening turn down service? After a day at the pool I really appreciated coming back to the room finding the towels restocked and the beds turned down with a chocolate treat on the pillows. 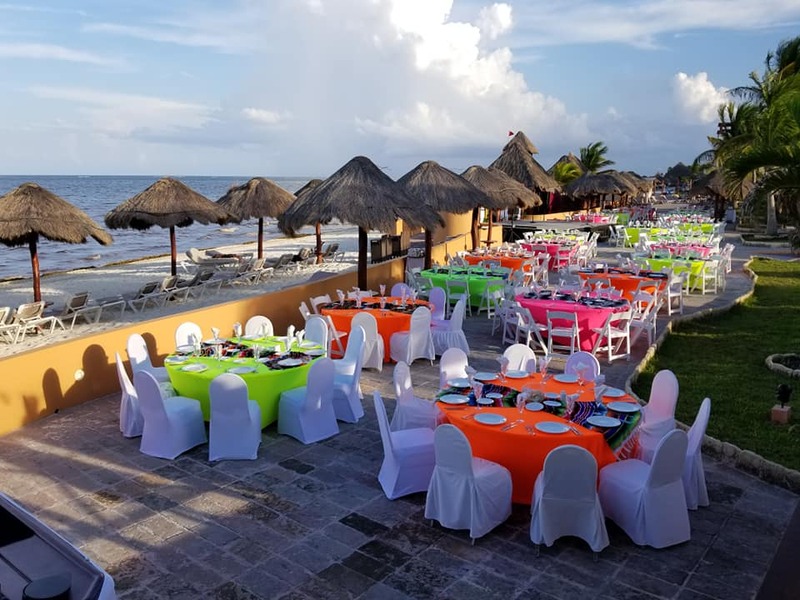 Dining at Now Sapphire is a bit different that at most all-inclusive hotels in that you don’t need reservations at most of the restaurants. In fact the only restaurant that requires reservations is the Asian Lemongrass Grill which is for the Teppanyaki experience. 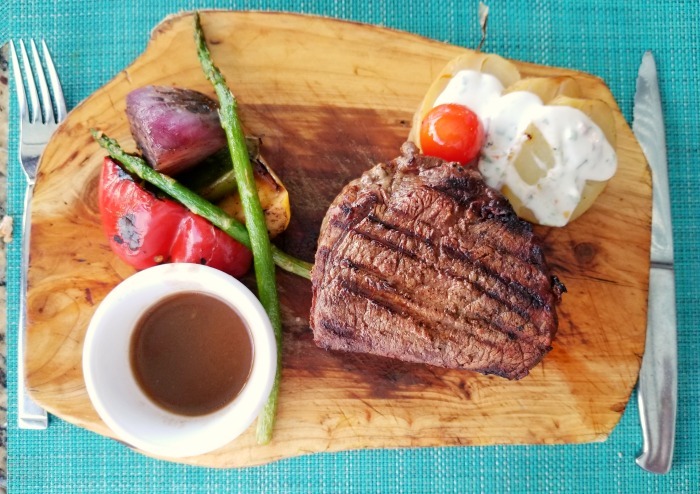 Please do yourself a favour and order the steak at the Bluewater Grill…yum! There are food options that span from the à la carte restaurants, a buffet, a grill and a café to the 24 hour room service. We have some food preferences being Keto and honestly I was impressed. At each restaurant we were asked if there were any allergies and the staff are quick to meet any kind of requirements we had. There are themed nights through the week, my favourite was the Mexican Fiesta that took place poolside! With the Preferred Club we had access to the Bluewater Grill for breakfast which was lovely and air conditioned but I have to say that the offerings at the buffet were divine as well. There is the omelette stations, plenty of fresh fruits, baked goods and so much more. 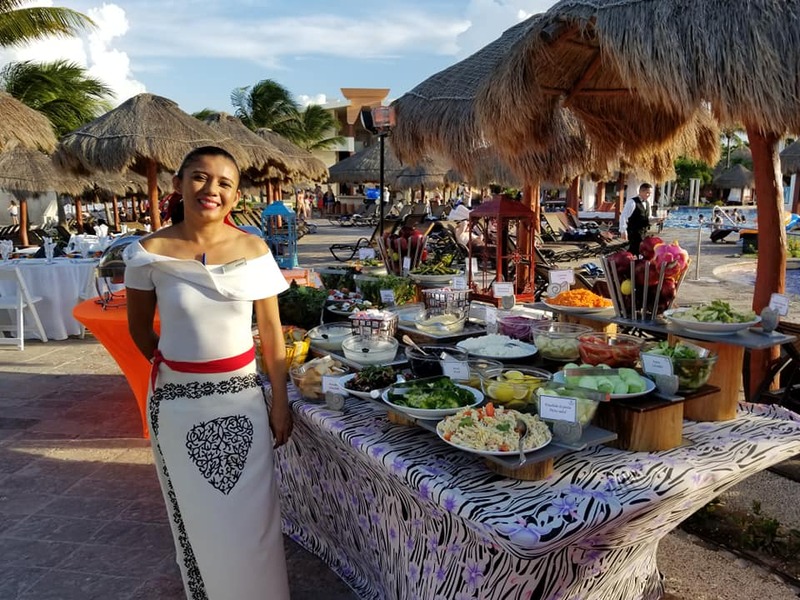 With fresh ingredients and plenty of consideration, the food at Now Resorts impressed our group! My girls are 12 and 14 so please understand when I write to you it’s because it’s rare that teenagers are pleased for the duration of our holidays. While wish it were as easy as just booking a holiday to entertain them, the fact is these teenage creatures require stimulation more than just laying on a sun lounger beside an incredible pool. Firstly let me tell you that the wifi was included in our package and the signal was STRONG! This led to some fantastic social sharing for my girls but really….it didn’t last long. They actually put down their phone. YES I’M SERIOUS! Now Sapphire kept the girls utterly entertained and they disconnected from their phones through the daytime hours until they were tucked into bed. A miracle I say! With the resort being a more intimate size, I allowed the girls to travel in a group of 3. 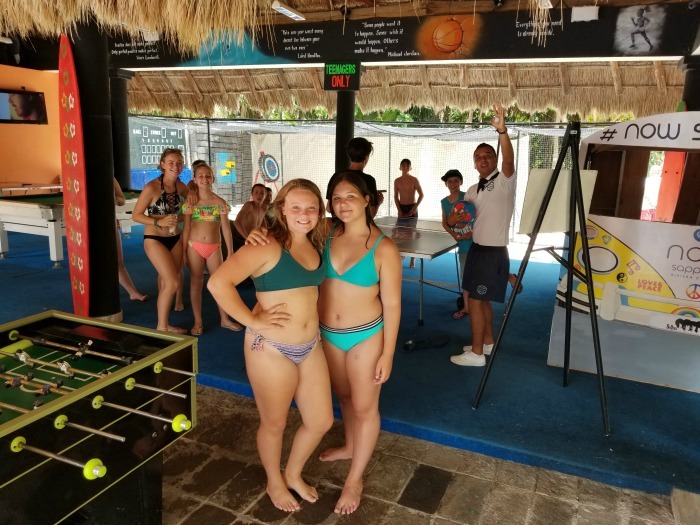 They would drop their things with me by the pool and off they went to grab a drink at the café, swim in the “teen pool” (a pool located next to teen club), join in the Activity Staff games or meet up with the gaggle of other teens they met at Teen Club. The Teen Club was high on my list of doubts if I am honest. We have been at many resorts which have a Teen Club that has bored my girls silly. This one is different! The location is right beside the main pool but it’s separated from view by hedges and the girls said it felt private. There are NO adults other than the Activity Staff who had a way of involving every teen into the mayhem. When I peeked in, I found everyone playing pool, ping-pong or chattering away. 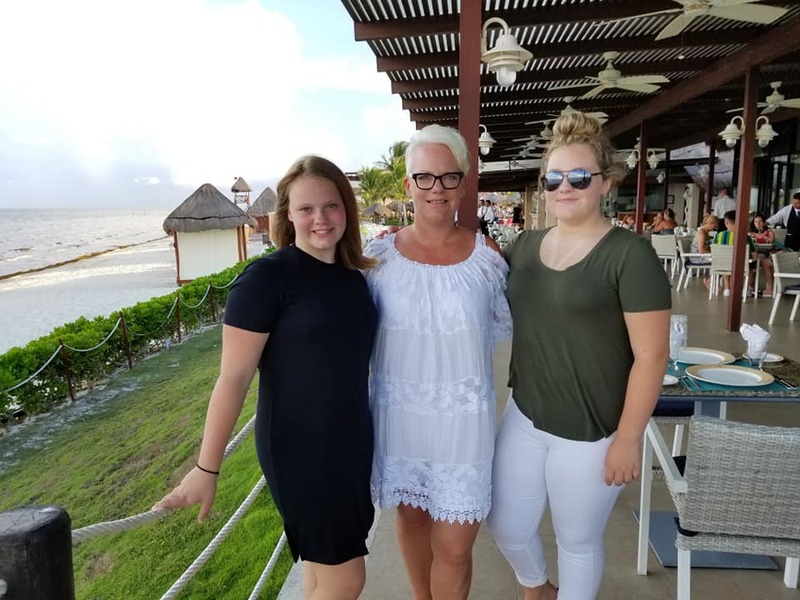 Within a few days the girls had met a large group of friends and Tammi and I would watch them all move around the resort together, enjoying everything. I have asked the girls for their input to list their favourite things because their perspective is different. Chelsea who is 12 loved the freedom, the wifi, the Teen Club staff, the pools and running around the resort with new friends. 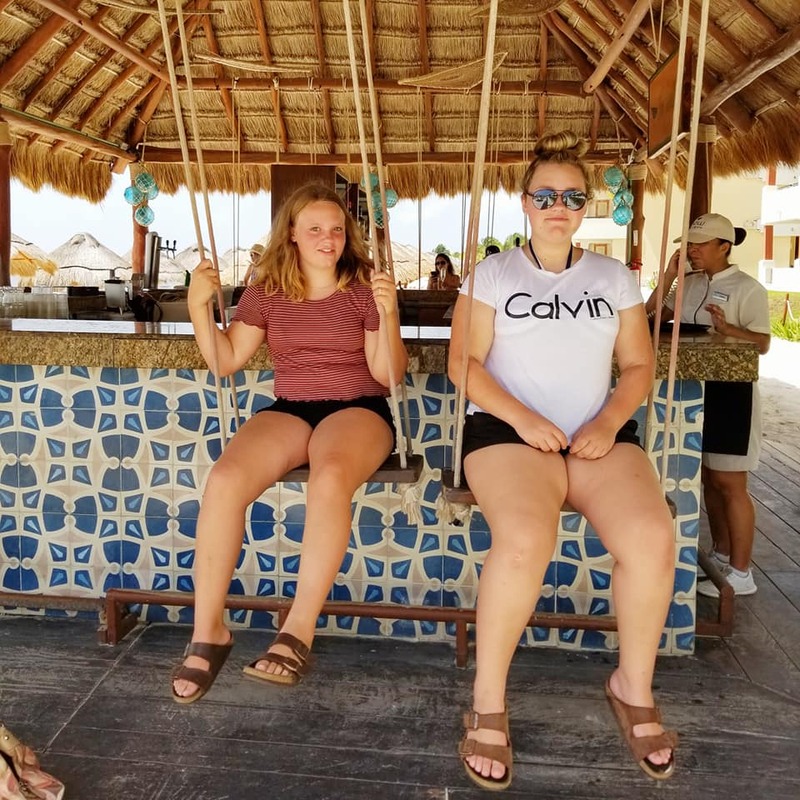 Sydney who is 14 appreciated having room service with our friends late at night, the entertainment in the lobby, the main pool activities, the Fish pedicure at the spa, the beach bar with the swings and of course the Preferred Club poolside cabanas. Now Sapphire is located right on the beach which is gorgeous. 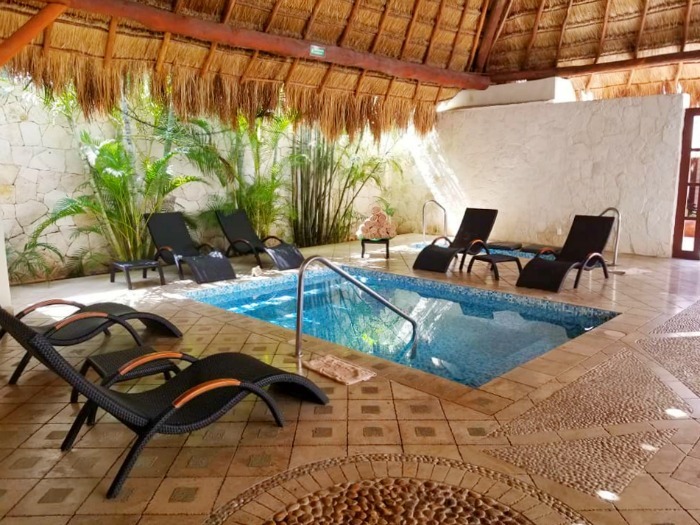 There are loungers, beach palapas, a beach side bar and non-motorized sports to enjoy! Right now the entire coast has a seaweed situation which may surprise guests if they are unaware. Know there there is seaweed which the resort is clearing daily but the water is clear once you walk out a bit. The girls did this daily and enjoyed their time finding fish and body surfing the waves. 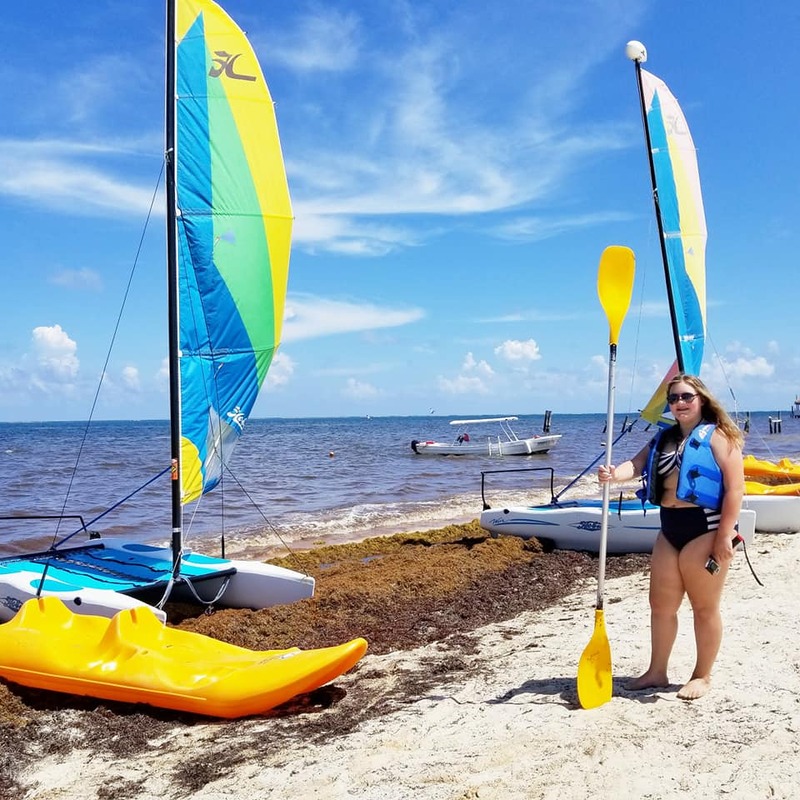 We also went kayaking at no extra charge and were a bit sad that we couldn’t fit in the time to enjoy a catamaran ride with one of the guides that is also no cost. There are 3 pools at Now Sapphire, the main one is the hub of action. There are in-pool lounge chairs, a swim up bar and activities to enjoy throughout the day. The Activity staff are AMAZING! Normally at a resort I watch guests consider getting involved but holding back…well at Now Sapphire the staff somehow gets you moving. 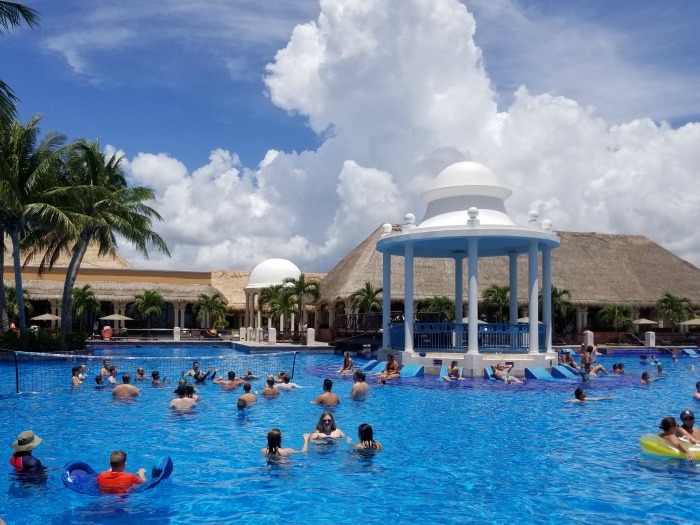 Even in my sloth-like state of relaxation, I got up and joined in to enjoy water aerobics and some pool volleyball each day. 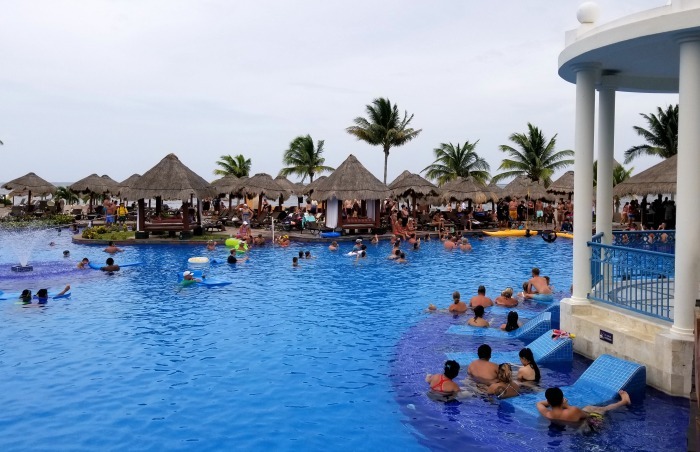 Many travellers at all-inclusive resorts get up at 7am to secure a pool lounge chair, it has become an unwritten rule because there usually aren’t enough chairs. At Now Sapphire one doesn’t have to do this. There are plenty of chairs for everyone and a rule that you cannot leave your belongings on a chair and leave and I warn you that this is enforced. The staff is truly plugged in so don’t worry if you’re in the pool that your items will be removed. 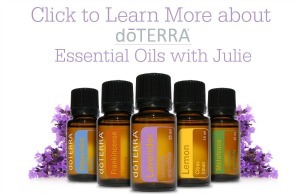 They know your name and are aware of where you are…honestly they are fantastic. 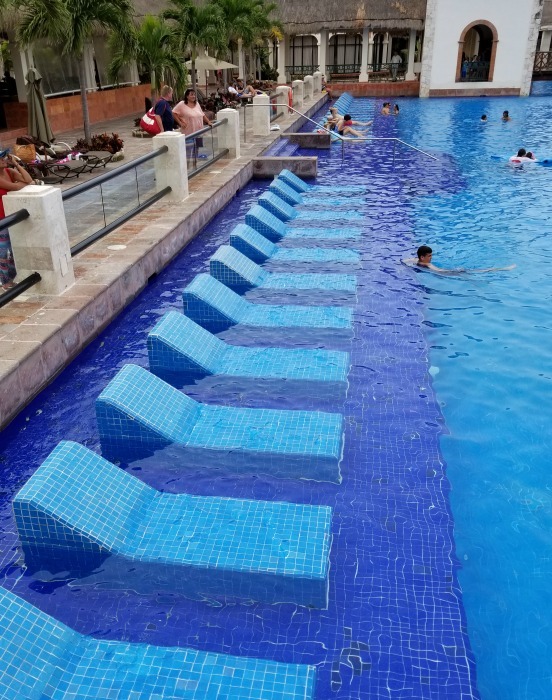 If you need a chair and can’t find one, the pool-side staff are happy to help you find one. 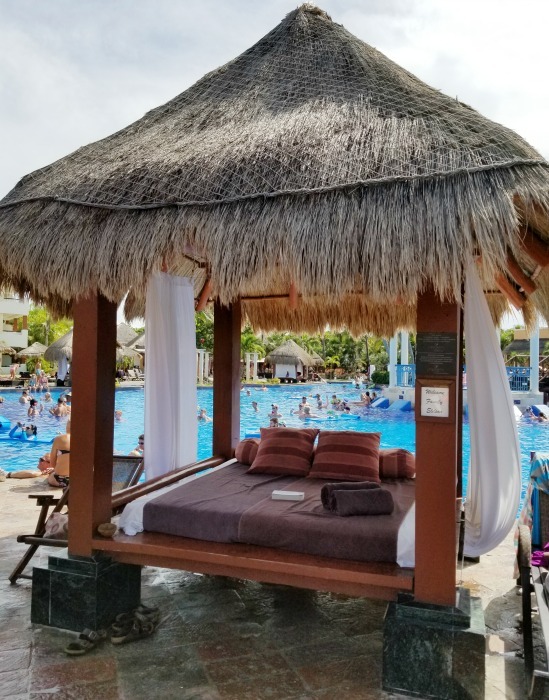 With the Preferred Club upgrade we were able to book cabanas for the next day. This was simply bliss! We also had access to the Adult Preferred Club pool which is a lovely escape. To say it’s tranquil would hit the nail on the head. I enjoyed some peace and quite at the pool when I wanted to escape a wee bit. The 3rd pool is located by the Teen Club and was often filled with kids. It was so nice to enjoy movies by the pool at night with the girls swimming with their friends. Nothing says relaxation like some spa time while on holiday. The Now Spa was a glorious treat for Tammi, my Sydney and I. This is a memory I will cherish. The spa has many services from massages, facials, manicures to body wraps which you can see here. With the Preferred Club upgrade you receive complimentary access to hydrotherapy circuit (20 minutes – per person, per stay) which I highly recommend. This is a BLAST!! 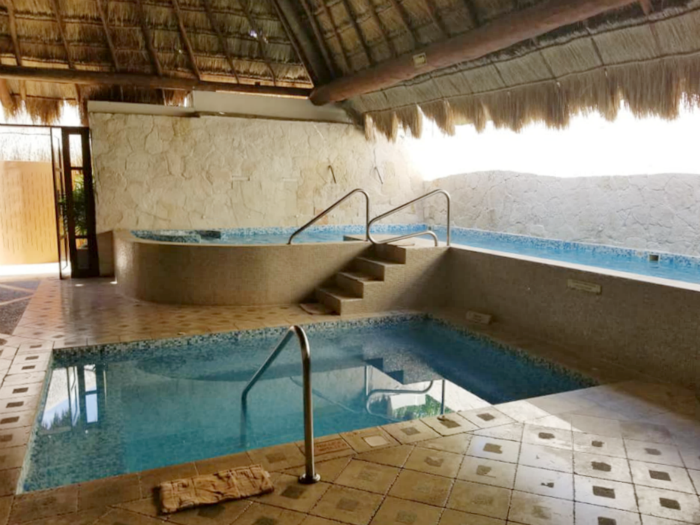 It is a circuit of hydrotherapy which includes a shower, warm pool, body jets, foot soaks and finally an incredible COLD pool which completely shocked me. My skin tingled and I felt utterly ALIVE. DO THIS FRIENDS….it’s so wonderful I don’t even have words. The staff treat you like a queen and it’s a day I’ll never forget. Our stay at Now Sapphire was special. Thank you to the staff who always knew our names and made us feel like we were truly at “home”. 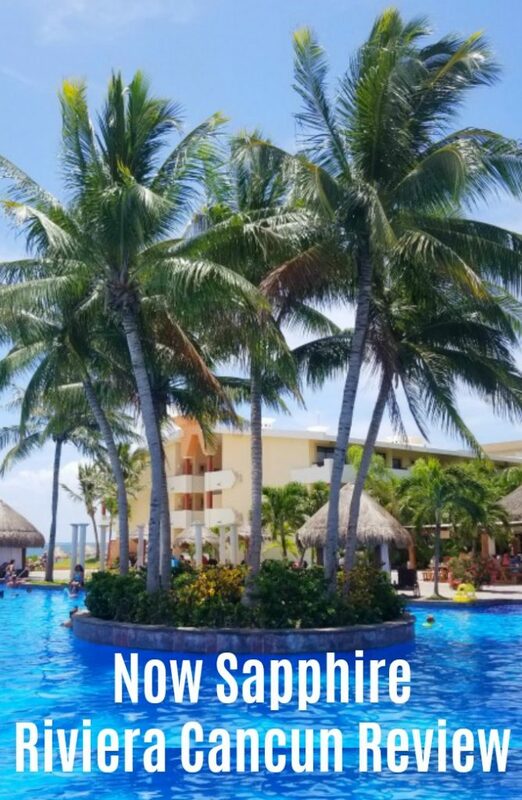 Make sure to check out the #GoNowSapphire hashtag on Instagram and Twitter, and re-live our trip and learn more about this fine resort option!